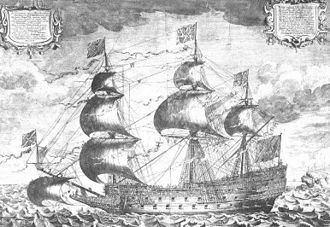 Fancy was Henry Every's ship, and was commanded by him between May 1694 to late 1695, when he retired from piracy and the fate of Fancy becomes unknown. 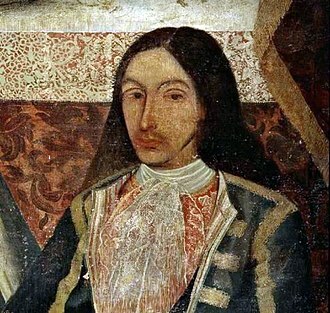 Fancy was initially a 46-gun privateer named Charles II – after Charles II of Spain – in Spanish service, commanded by a Captain Gibson, and was anchored at A Coruña, Spain. On 7 May 1694, Henry Every and a few other conspirators organised and carried out a successful mutiny and, setting Captain Gibson ashore, left A Coruña for the Cape of Good Hope. 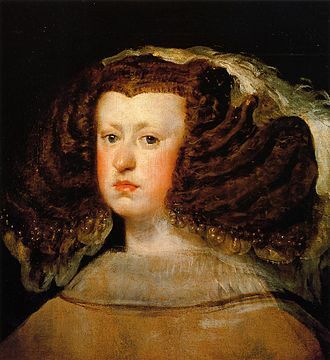 At this time, Charles II was renamed Fancy. Upon arriving at the Cape, Every sailed to the island of Johanna (Anjouan) in the Comoros Islands, where he had Fancy careened – removing barnacles and weed from the section of the hull that was permanently below water, increasing her speed. He also had Fancy razeed, intentionally removing parts of the ship's superstructure in order to increase her speed. 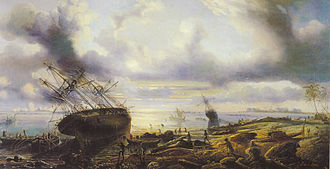 Following this work, Fancy became one of the fastest ships active in the Indian Ocean, and Every used this speed to attack and take a French pirate ship, looting the vessel and recruiting approximately 40 of the crew to his own ship, leaving him with a total complement of around 150. Every continued to be active in the Indian Ocean where he worked alongside other famous pirates of his time, including Thomas Tew. 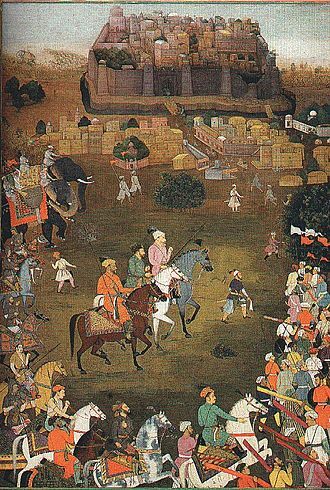 Most notable in his captures was Ganj-I-Sawai, a Mughal ship under the command of Ibrahim Khan during Emperor Aurangzeb's era. Mounting 62 cannons and four to five hundred musket-armed guards, cannon fire from Fancy was instrumental in Every's victory – the first salvo caused a cannon to explode, and a number of gunners were killed. Every's career ended when the crew returned to Nassau in April 1696, in the Bahamas, where Every returned to Britain aboard the sloop Sea Flower, arriving in Ireland in June 1696, where he promptly disappeared. Although the fate of Fancy is unknown, it was rumored that Every gave her to the governor of Nassau as a bribe. There is supporting documentary evidence that the Fancy was run aground on New Providence and Governor Trott had the guns and everything of value stripped. Nassau is the capital, largest city, and commercial centre of the Commonwealth of the Bahamas. The city has an population of 274,400 as of 2016. The city is located on the island of New Providence, which much like a business district. Nassau is the site of the House of Assembly and various departments and was considered historically to be a stronghold of pirates. The city was named in honour of William III of England, nassaus modern growth began in the late eighteenth century, with the influx of thousands of American Loyalists and their slaves to the Bahamas following the American Revolutionary War. Many of them settled in Nassau and eventually came to outnumber the original inhabitants, as the population of Nassau grew, so did its populated areas. Today the city dominates the island and its satellite, Paradise Island. However, until the post-Second World War era, the outer suburbs scarcely existed, most of New Providence was uncultivated bush until Loyalists were resettled there following the American Revolutionary War, they established several plantations, such as Clifton and Tusculum. 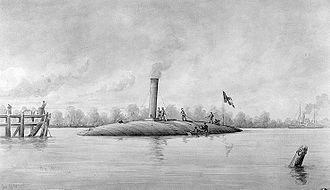 In addition, slaves freed from American ships, such as the Creole case in 1841, were allowed to settle there, Nassau was formerly known as Charles Town, it was burned to the ground by the Spanish in 1684 during one of their frequent wars with the English. The name Nassau derives from the House of Nassau and ultimately from the town of Nassau, due to a lack of effective Governors, Nassau fell on hard times. In 1703 Spanish and French allied forces briefly occupied Nassau, from 1703 to 1718 there was no governor in the colony and by 1713, the sparsely settled Bahamas had become a pirate haven. The Governor of Bermuda stated that there were over 1,000 pirates in Nassau and they proclaimed Nassau a pirate republic, establishing themselves as governors. 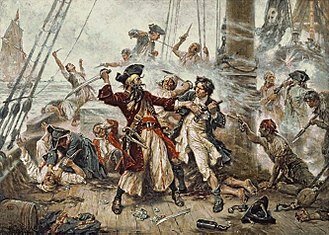 Examples of pirates that used Nassau as their base are Charles Vane, Thomas Barrow, Benjamin Hornigold, Calico Jack Rackham, Anne Bonny, Mary Read, in 1718, the British sought to regain control of the islands and appointed Captain Woodes Rogers as Royal governor. The Indian Ocean is the third largest of the worlds oceanic divisions, covering 70,560,000 km2. 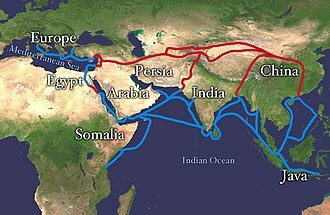 It is bounded by Asia on the north, on the west by Africa, on the east by Australia, the Indian Ocean is known as Ratnākara, the mine of gems in ancient Sanskrit literature, and as Hind Mahāsāgar, in Hindi. The northernmost extent of the Indian Ocean is approximately 30° north in the Persian Gulf, the oceans continental shelves are narrow, averaging 200 kilometres in width. An exception is found off Australias western coast, where the width exceeds 1,000 kilometres. The average depth of the ocean is 3,890 m and its deepest point is Diamantina Deep in Diamantina Trench, at 8,047 m deep, Sunda Trench has a depth of 7, 258–7,725 m. North of 50° south latitude, 86% of the basin is covered by pelagic sediments. The remaining 14% is layered with terrigenous sediments, glacial outwash dominates the extreme southern latitudes. The major choke points include Bab el Mandeb, Strait of Hormuz, the Lombok Strait, the Strait of Malacca, the Indian Ocean is artificially connected to the Mediterranean Sea through the Suez Canal, which is accessible via the Red Sea. All of the Indian Ocean is in the Eastern Hemisphere and the centre of the Eastern Hemisphere is in this ocean, marginal seas, gulfs and straits of the Indian Ocean include, The climate north of the equator is affected by a monsoon climate. 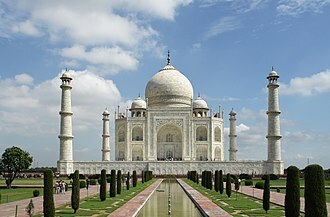 Strong north-east winds blow from October until April, from May until October south, in the Arabian Sea the violent Monsoon brings rain to the Indian subcontinent. In the southern hemisphere, the winds are milder. When the monsoon winds change, cyclones sometimes strike the shores of the Arabian Sea, the Indian Ocean is the warmest ocean in the world. Long-term ocean temperature records show a rapid, continuous warming in the Indian Ocean, Indian Ocean warming is the largest among the tropical oceans, and about 3 times faster than the warming observed in the Pacific. Research indicates that human induced greenhouse warming, and changes in the frequency, among the few large rivers flowing into the Indian Ocean are the Zambezi, Shatt al-Arab, Godavari, Narmada, Brahmaputra and Irrawaddy River. The Cape of Good Hope is a rocky headland on the Atlantic coast of the Cape Peninsula, South Africa. 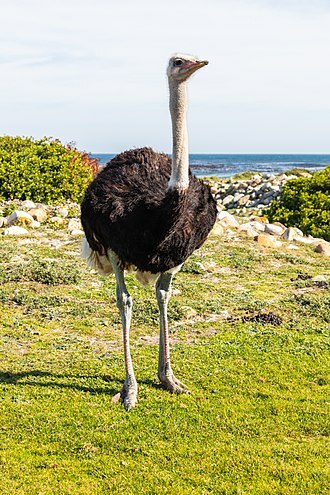 In fact, the southernmost point of Africa is Cape Agulhas, when following the western side of the African coastline from the equator, the Cape of Good Hope marks the point where a ship begins to travel more eastward than southward. 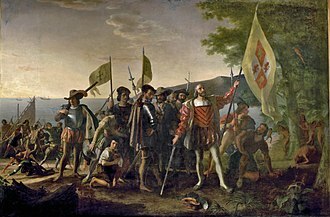 Thus, the first modern rounding of the cape in 1488 by Portuguese explorer Bartolomeu Dias was a milestone in the attempts by the Portuguese to establish trade relations with the Far East. Dias called the cape Cabo das Tormentas, which was the name of the Cape of Good Hope. As one of the capes of the South Atlantic Ocean. It is a waypoint on the Cape Route and the route followed by clipper ships to the Far East and Australia. 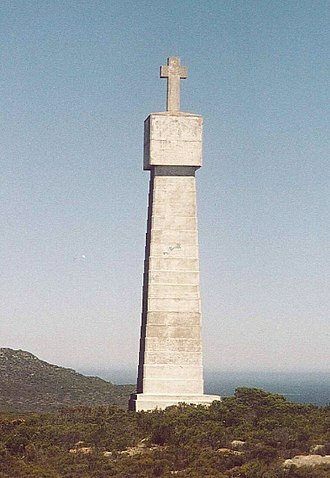 The term Cape of Good Hope is used in three ways, It is a section of the Table Mountain National Park, within which the cape of the same name, as well as Cape Point. Prior to its incorporation into the park, this section constituted the Cape Point Nature Reserve. It was the name of the early Cape Colony established by the Dutch in 1652, just before the Union of South Africa was formed, the term referred to the entire region that in 1910 was to become the Cape of Good Hope Province. 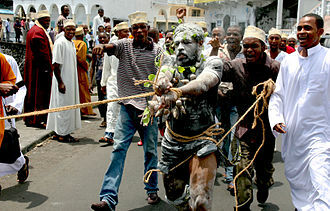 When Eudoxus was returning from his voyage to India the wind forced him south of the Gulf of Aden. Somewhere along the coast of East Africa, he found the remains of the ship, due to its appearance and the story told by the natives, Eudoxus concluded that the ship was from Gades and had sailed anti-clockwise around Africa, passing the Cape and entering the Indian Ocean. This inspired him to repeat the voyage and attempt a circumnavigation of the continent, organising the expedition on his own account he set sail from Gades and began to work down the African coast. The difficulties were too great, and he was obliged to return to Europe, after this failure he again set out to circumnavigate Africa. Although some, such as Pliny, claimed that Eudoxus did achieve his goal, in the 1450 Fra Mauro map, the Indian Ocean is depicted as connected to the Atlantic. 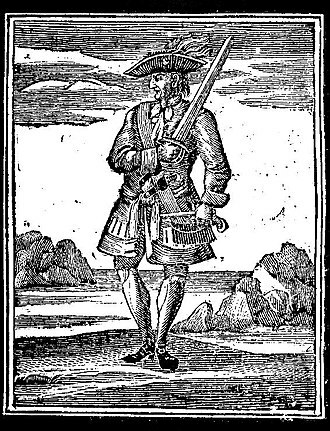 Thomas Tew, known as the Rhode Island Pirate, was a 17th-century English privateer-turned-pirate. He embarked on two major piratical voyages and met a bloody death on the journey, and he pioneered the route which became known as the Pirate Round. Many other famous pirates followed in his path, including Henry Avery, much of what is known about Tew is derived from Captain Charles Johnsons A General History of the Pyrates, which is a mixture of fact and fiction. 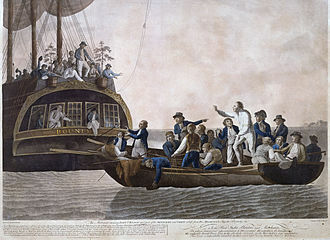 When reading about Thomas Tew, it is important to be able to distinguish between truth and story, Captain Johnson said, Tew, in Point of Gallantry, was inferior to none. It is frequently written that Tew had family in Rhode Island dating back to 1640 and he may have been born in New England. One theory is that he was born in Maidford, England before emigrating to the colonies as a child with his family and he lived at one time in Newport, Rhode Island. Tew is reported as being married with two daughters, according to one source, his wife and children all greatly enjoyed the New York City social scene after Tew struck it rich, but there is no supporting evidence elsewhere for this. 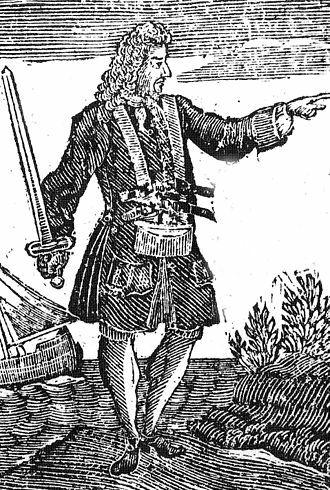 In 1691, Tew moved to Bermuda, there is evidence that he was already reputed as a pirate at that time, but no modern historian has determined whether this reputation was earned or not. He may simply have engaged in privateering against French and Spanish ships and he was in close relations with fellow pirate Captain Want who was his closest ally. 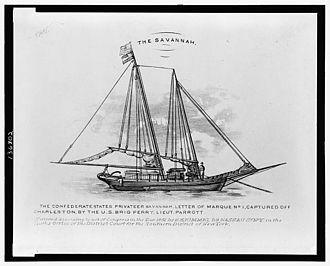 In 1692, Thomas Tew obtained a letter of marque from the Governor of Bermuda, various Bermudian backers provided him with a vessel, the seventy-ton sloop Amity, armed with eight guns and crewed by forty-six officers and men. He and another captain obtained a commission from the lieutenant governor of Bermuda to destroy a French factory off the coast of West Africa. Thus equipped, Tew set sail in December, ostensibly to serve as a privateer against French holdings in The Gambia. But not long out of Bermuda, Tew announced his intention of turning to piracy, Tews crew reportedly answered with the shout, A gold chain or a wooden leg, well stand with you. New Providence is the most populous island in the Bahamas, containing more than 70% of the total population. It houses the national city of Nassau. The island was originally under Spanish control following Christopher Columbuss discovery of the New World, the islands largest city, was formerly known as Charles-town, but it was burned to the ground by the Spanish in 1684. It was laid out and renamed Nassau in 1695 by Nicholas Trott, the three branches of Bahamian Government, the executive, the legislative, and the judiciary, are all headquartered on New Providence. New Providence functions as the commercial hub of the Bahamas. It is home to more than 400 banks and trust companies, the name New Providence Island is derived from a 16th‐century governor who gave thanks to Divine Providence for his survival after a shipwreck. The New was added to distinguish it from Providencia off the Mosquito Coast used by pirates, after 1670, Bermudian salt rakers gathering sea salt in Grand Turk and Inagua became regular visitors to the island. The first lasting European occupation was on Eleuthera in 1648, by 1670, there were over 900 people on the settlement of Charles-Town. Due to ineffective governors, Charles-Town was attacked by the French and Spanish navies, became a base for pirates. However, two in 1686, new English colonists from Jamaica came and settled. They were called back by the governor of Jamaica, but they ignored this order, in 1695, Governor Nicolas Trott rebuilt the town and added a fort, both were called Nassau. 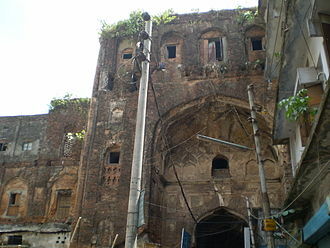 However, the fort was damaged in a Spanish attack in 1700. 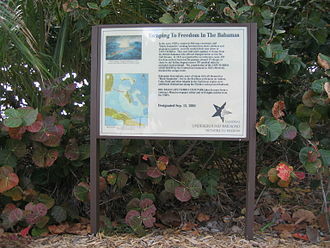 Due to the lack of cannon and soldiers in the fort, by 1713, there were over 1000 pirates in Nassau and they outnumbered the 400–500 law-abiding inhabitants. In 1718, Governor Woodes Rogers came in and offered a pardon for any willing to give up their ways. Using his intelligence and threatening to them if they did not take the pardon. In February 1776, American Esek Hopkins led a squadron of seven ships in an effort to raid the British-held island in order to secure supplies. 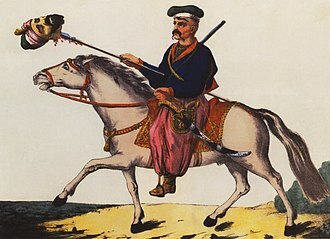 The Uskoks were irregular soldiers in Habsburg Croatia that inhabited areas on the eastern Adriatic coast and surrounding territories during the Ottoman wars in Europe. Etymologically, the word itself means the ones who jumped in in Croatian. Bands of Uskoks fought a war against the Ottomans, and they formed small units. Since the uskoks were checked on land and were paid their annual subsidy. The exploits of the Uskoks contributed to a renewal of war between Venice and the Ottoman Empire, an extremely curious picture of contemporary manners is presented by the Venetian agents, whose reports on this war resemble a knightly chronicle of the Middle Ages. These chronicles contain information pertaining to single combats and other chivalrous adventures, many of these troops served abroad. At the Battle of Lepanto in 1571, for example, a Dalmatian squadron assisted the allied fleets of Spain, Austria, after a series of incidents that escalated into the Uskok War, the Uskok activity in their stronghold of Senj mostly ceased. Large numbers of Serb fugitives from Bosnia and Serbia fleeing the Ottomans, in 1522 the border territory of Senj was taken over by the Habsburgs under the authority of Archduke Ferdinand, forming a state-controlled Militärgrenze, or Military Frontier. 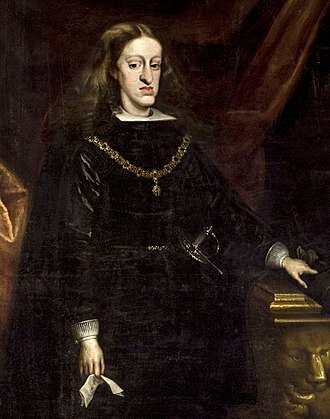 The Austrian Emperor Ferdinand I instituted a system of planting colonies of defenders along the Military Frontier, the Uskoks were promised an annual subsidy in return for their services. Numerous refugees from Ottoman areas began settling along this territory, crossing the border to escape Ottoman attacks. Christian guerilla resistance in Ottoman-occupied areas of Dalmatia and Bosnia caused these people to flee and settle down, first at the fortress of Klis along the Military Frontier, at Senj. A body of these uskoks led by Croatian captain Petar Kružić used the base at Klis both to hold the Turks at bay, and to engage in marauding and piracy against coastal shipping. 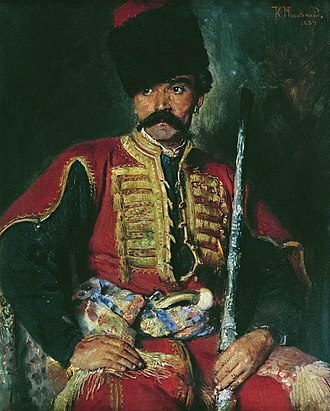 Although nominally accepting the sovereignty of the Habsburg Emperor Ferdinand I, after Petar Kružićs death, and the lack of water supply, the defenders of Klis finally surrendered to the Ottomans in exchange for their freedom. Anglo-Turkish piracy or the Anglo-Barbary piracy refers to the collaboration between Barbary pirates and English pirates against Catholic shipping during the 17th century. The Protestants and the Muslim Turks and Berbers, more precisely the Barbary pirates, collaborated during that period against their common enemy and this collaboration has to be seen in the context of the wars of religions and the ongoing mortal battle between Protestantism and Catholicism. At that time, Spain and France, which were implementing anti-Protestant policies, were the target of this Anglo-Muslim collaboration. Piracy in the ranks of the Muslim pirates of Barbary was a way to find employment, abandoning England as well as their faith was often a way to financial success, as fortunes could be made by attacking Christian shipping. By 1610, the wealth of English renegade pirates had become so famous as to become the object of plays, not only the English corsairs participated to this collaboration, but the Dutch, who shared the same objectives. Catholic ships were attacked and prisoners taken to Algiers or other places of the Barbary Coast to be sold as slaves, the number of these English pirates was significant. Jack Ward, Henry Mainwaring, Robert Walsingham and Peter Easton were among such English pirates in the service of the deys of the Barbary coast, some of the most famous Dutch pirates were Zymen Danseker, Salomo de Veenboer and Jan Janszoon. Some of them, such as Ward and Danseker, were renegades who had adopted Islam, Mainwaring attacked the Spanish preferentially, and claimed that he avoided English shipping, but generally ships of all nationalities seem to have been attacked. Walsingham is known to have freed Turkish captives from Christian galleys, Janszoon led long-ranging raids such as the Turkish Abductions in Iceland to sell his slaves on the Barbary Coast. For France, it was a conspiracy against Catholicism, described at the time as Turco-Calvinism. In order to curb these actions, Spain made a proclamation against piracy, England probably became ambivalent about this sort of piratical collaboration as it attacked Algiers in 1621 in order to free Christian captives there. The Barbary Coast, or Berber Coast, was the term used by Europeans from the 16th until the 19th century to refer to much of the collective land of the Berber people. Today, the term Greater Maghreb or simply Maghreb corresponds roughly to Barbary, the term Barbary Coast emphasizes the Berber coastal regions and cities throughout the middle and western coastal regions of North Africa – what is now Morocco, Algeria and Libya. 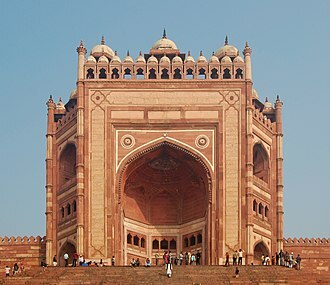 The name is derived from the Berber people of north Africa, the slaves and goods were being traded and sold throughout the Ottoman Empire or to the Europeans themselves. Barbary was not always a political entity. From the 16th century onwards, it was divided into the political entities of the Regency of Algiers, major rulers during the times of the Barbary states plundering parties included the Pasha or Dey of Algiers, the Bey of Tunis and the Bey of Tripoli. 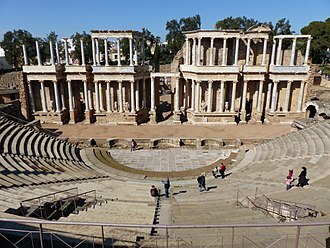 Before then, the territory was divided between Ifriqiya, and a west-central Algerian state centered on Tlemcen or Tiaret. A sloop is a sailing boat with a single mast and a fore-and-aft rig. A sloop has only one head-sail, if a vessel has two or more head-sails, the cutter is used, and its mast may be set further aft than on a sloop. The most common rig of modern sailboats is the Bermuda-rigged sloop, typically, a modern sloop carries a mainsail on a boom aft of the mast, with a single loose-footed head-sail forward of the mast. Sloops are either masthead-rigged or fractional-rigged, on a masthead-rigged sloop, the forestay attaches at the top of the mast. The mainsail may be smaller than the headsail, which is called a genoa jib. On a fractional-rigged sloop, the forestay attaches to the mast at a point below the top, typically 3/4 of the way to top, or perhaps 7/8 or some other fraction. The mast of a fractional-rigged sloop may be placed forward, compared to a masthead-rigged sloop. After the cat rig, which has only a mainsail, the rig is one of the simpler sailing rig configurations. A sloop typically has two sails, a mainsail and a headsail, while the cutter has a mainsail and two or more headsails, next in complexity are the ketch, the yawl and the schooner, each of which has two masts and a minimum of three sails. A sloop has a system of mast rigging — a forestay. Jumbe-Souli, queen of the Comorian island of Mohéli, receiving a French delegation, 1863. 1883 description of the racing of Bermudian sloops, by Lady Brassey, with illustrations showing the Bermuda rig. 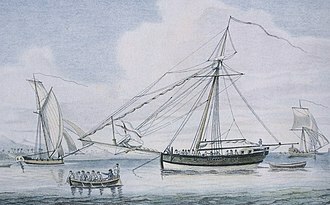 The working sloops that were used for weekend races were effectively smaller versions of the ocean-going Bermuda sloop. Battle between Dutch and Spanish ships on the Haarlemmermeer, 26 May 1573. Sailing before the wind from the right are the Spanish ships, identified by the flags with a red cross. Approaching from the left are the ships of the Sea Beggars. 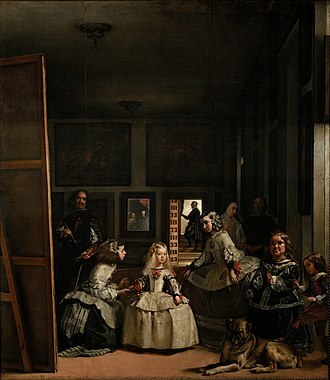 Hendrick Cornelisz Vroom. Relief of Leiden by the Sea Beggars on flat-bottomed boats, on 3 October 1574, during the Siege of Leiden. Otto van Veen, 1574. Traditional emblem of the Geuzen. William II de la Marck (1542-1578), a leader of the Sea Beggars. Stitch with Uskok-ships chasing a large ship. Museum of Fortress Nehaj in Senj, Croatia. During this defense of the Klis Fortress against an Ottoman invasion, an elite Croatian military faction of Uskoci was formed. 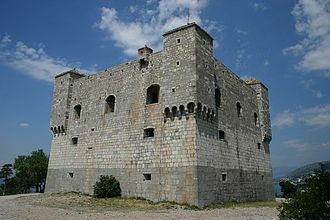 Nehaj Fortress in Senj, built by Ivan Lenković in 1558. Carniolan Uskoks in an engraving from Johann Weikhard von Valvasor's work The Glory of the Duchy of Carniola, 17th century. The Yangtze River of China, a hotbed of river pirate activity from the nineteenth century until the end of the Chinese Civil War in 1949, which was combated by patrols of American and European gunboat flotillas. The Mekong River, where modern-day Asian river piracy exists. The Balkan Narentines, of the ninth and tenth centuries were known for piracy on the River Neretva. The Ushkuiniks were Russian Novgorodian Volga river pirates from the tenth to the fourteenth centuries. Both medieval river pirate groups were Slavic versions of Viking river raiders. Destruction of the privateer Petrel by the USS St. Lawrence. Suspected pirates assemble on the deck of a dhow near waters off of western Malaysia, January 2006. The Strait of Malacca has been a major area of pirate activity. 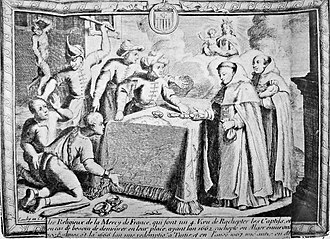 Purchase of Christian captives by Catholic monks in the Barbary States. Bombardment of Algiers in 1682, by Abraham Duquesne. Thomas Tew relates his exploits to Gov. Fletcher of New York. Painting by Howard Pyle.